I first moved to Calgary when the city was little more than one hundred years old. Coming from a country where a ‘new’ bridge built to replace an ‘old’ one could still be 500 years old, it didn’t seem to me that a place like Calgary could have much history. In the first place, the peoples of the First Nations had lived here for thousands of years with a history and traditions as old – if not older – than that of my home country. Secondly.. we might think of history as being the realm of kings and queens, dukes and earls, generals and admirals, after all, they’re the ones who get their names in the history books. But REAL history is made by ordinary people doing extraordinary things. And when you see a city transformed from a simple wooden fort to a shining metropolis in less than four generations… well that’s purely down to the ambition, hard work and vision of those ‘ordinary’ people. Here are two of those people whose graves can be found in Union Cemetery. COLONEL JAMES FARQUHARSON MACLEOD: Born in Scotland in 1836, he trained in Ontario as a lawyer, before joining the NWMP. 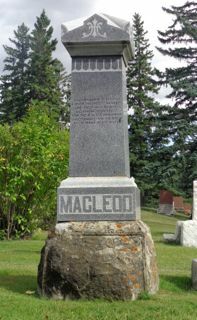 Macleod was part of the famous March West in 1874, its remit being to establish law and order, stop the illegal whiskey trade, protect Canada’s border from encroachment by the Americans, and open up preliminary negotiations with the First Nations. He founded the fort, named in his honour – Fort Macleod – in what is now Alberta on the US/Canada border. In 1875, he ordered Inspector Brisbois and 50 men from ‘F’ tropp to establish a post on the Bow River. Initially called Fort Brisbois, the name was changed to Calgary (after a village in Scotland) on the suggestion of Colonel Macleod. Trusted by the First Nations as an honourable man, he was one of the signatories to Treaty Number 7 with the mainly Blackfoot First Nations. Despite being Commissioner of the NWMP and working as a magistrate and judge, he died in 1894 a poor man, leaving a wife, five children and just $8. JOHN WARE: Born into slavery in South Carolina in 1845, he moved west at the end of the American Civil War, finding work on a ranch in Texas where he became a skilled horseman. In 1882 he came to Canada on one of the great cattle drives north. He worked on various ranches (including the famous Bar U) before buying his own homestead in 1890 and then creating a ranch east of Brooks. Over time, he owned 1,000 head of cattle and 100 horses under his 9999 (The Four Nine) brand. Tragically, for a man of whom it was said, “The horse is not running on the prairie that John Ware can’t ride,” he died on September 12th, 1905 when his horse stumbled on a gopher hole and fell on him. He was killed instantly. 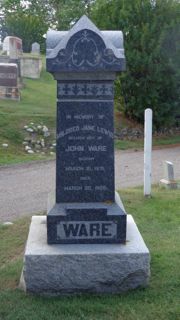 John Ware‘s name is remembered in Calgary by John Ware Junior High School and the John Ware Building at the Southern Alberta Insititute of Technology. He is also commemorated in Mount Ware and Ware Creek. This entry was posted in History, Travel and tagged Alberta, Bar-U Ranch, Calgary, Colonel Macleod, Fort Macleod, James Farquharson Macleod, John Ware, March West, Mount Ware, NWMP, Union Cemetery, Ware Creek, Western Canada. Bookmark the permalink. Thank you for sharing these amazing stories with us. These men are an inspiration not just of us in general, but for me personally as a writer. They’re such great people, aren’t they!